When season end in motorsports, a fair-weathered relationship between a departing driver from their race team usually results as a positive resolution. After all, both parties benefit from the lessons of strong performances heading into a brand new season season. The past NASCAR Sprint Cup race at Charlotte Motor Speedway has shown one example where a driver and team pairing were unable to weather what was 5 remaining races of the 2010 schedule. Announced by a brief news release by Richard Petty Motorsports (RPM), the #9 driver Kasey Kahne has been told his services are no longer required with the team. Following Kahne's lap 125 accident in the Saturday night race linked to poor brakes on the #9 Budweiser Ford Fusion. When it came time to send a damaged but still speedway-worthy Sprint Cup car to the track for car owner points, Kasey Kahne claimed to be ill. JJ Yeley stepped into the team's #9 Ford to come home in 38th place for RPM and Kahne. The next day, suspicions heated up as Kasey Kahne (apparently too ill to finish the Saturday night NASCAR Sprint Cup race) appeared in excellent shape to run a 5K charity marathon. At that time, it was becoming theoretical that Kahne's devotion to the #9 RPM Ford had digressed. Two races prior at Kansas Speedway, Kahne perhaps showed less obvious but still reckless regard for this team's car. After suffering a flat tire, Kahne proceeded at an ill-advisably high rate of speed causing massive body damage to the team's car. 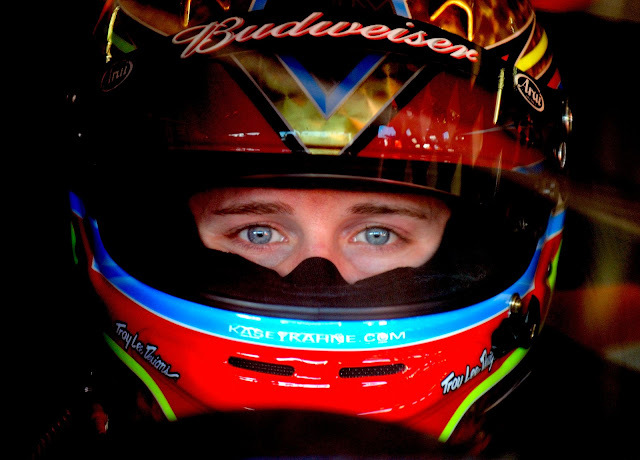 Entering the NASCAR Sprint Cup series in 2004, the then-24 year old rookie Kasey Kahne first belted into the red #9 car. En route to a rookie of the year title before winning 11 races in NASCAR's top series, Kahne hung around the #9 car as it proceeded through several ownership structures to the present Richard Petty Motorsports, crew member changes and even a change from Dodge to Ford in 2010. Making a 2012 commitment with Hendrick Motorsports, Kahne prepared to finish the 2010 season with RPM but results were mixed as Kahne currently sits 21st in Sprint Cup drivers points. In the place of Kasey Kahne, the team will opt for Aric Almirola to fill in at the short track of Martinsville Speedway. Recording 30 career NASCAR Sprint Cup starts, Almirola has been running the majority of his past two seasons in the Camping World Truck Series. Since Almirola was slated to drive the #83 Red Bull Toyota, the vacant seat is likely to be filled by their 2011 driver who happens to be Kasey Kahne. Waiting out to opening of his Hendrick Motorsport ride, Kahne's plan to run a Toyota for Team Red Bull was already agreed upon by all parties for the 2012 plans. As for the plans of Richard Petty Motorsports, the team's future is less concrete as 2010 nears an end. As the #9 Ford's sponsor Budweiser announced it was leaving the team, the #98 driver Paul Menard is leaving, along with his sponsorship, Elliott Sadler has only a slight chance to retaining his #19 ride and only AJ Allmendinger remains as the future of the RPM team. 2011 will be a massive building year for RPM and Kahne's release for the remainder of the NASCAR Sprint Cup 2010 tour sets the process in motion early. While Aric Almirola is driving the RPM #9 Ford this weekend at Martinsville, it's unlikely Almirola will be involved with long-term plans since he has already signed with JR Motorsports in the NASCAR Nationwide Series. With Kasey Kahne losing his #9 Richard Petty Motorsports ride on apparently not-so positive terms, this would not be the first time the driver has parted a team on shaky grounds. In 2003, Kasey Kahne deal to move to the #9 Dodge NASCAR Sprint Cup car for the next season came as he was under contract as a development driver with Ford Racing. Afterwards, Ford attempted to sue Kahne for breach of contract but ultimately lost. Ironically, Kahne would once again drive for Ford when the #9 Sprint Cup car left Dodge.